Thomas’s practice is focused on serving Veterans. He represents individuals and class actions in USERRA litigation and individuals and organizations in state and federal civil appeals. Thomas received his JD from Gonzaga University School of Law in 2007 and a MBA from the Columbia College School of Business in 2000. During law school he served as an associate editor for the Gonzaga Journal of International Law and as a Thomas More Scholar. Following law School, Thomas served in a two year clerkship at the Washington State Court of Appeals Div. III. Thomas is admitted to practice in Washington State; the Federal District Courts of Washington, Colorado, Nebraska, and Wisconsin; the 5th, 7th, 8th, 9th, 10th, 11th and the Federal Circuit Court of Appeals; the Merit System Protection Board; and the United States Supreme Court. 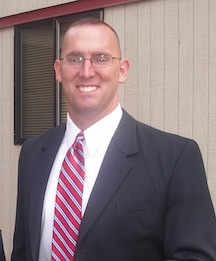 Thomas currently serves as the chair of the Washington State Veterans Bar Association. He is an accredited attorney by the U.S. Department of Veterans Affairs and his law firm is certified by the Washington State DAV as a Veteran Owned Business. Thomas has a 10/10 “Superb” rating from the AVVO legal rating forum and is “AV” rated, a “Preeminent” rating from both peers and clients through Martindale-Hubbell. Thomas is also a contributing member of the National Employment Lawyers Association (NELA) and an Eagle Member of the Washington State Association of Justice (WSAJ). Thomas has 25 years of service in the United States Marine Corps and Reserve with two combat tours in Iraq. He is active in his state and local Veterans communities and a life member of both the Reserve Officers Association and Disabled American Veterans. His pro bono work consists of representing Veterans and survivors in benefits and appeal cases. Thomas resides in Spokane, WA with his wife and three children. - View Thomas’s personal site.